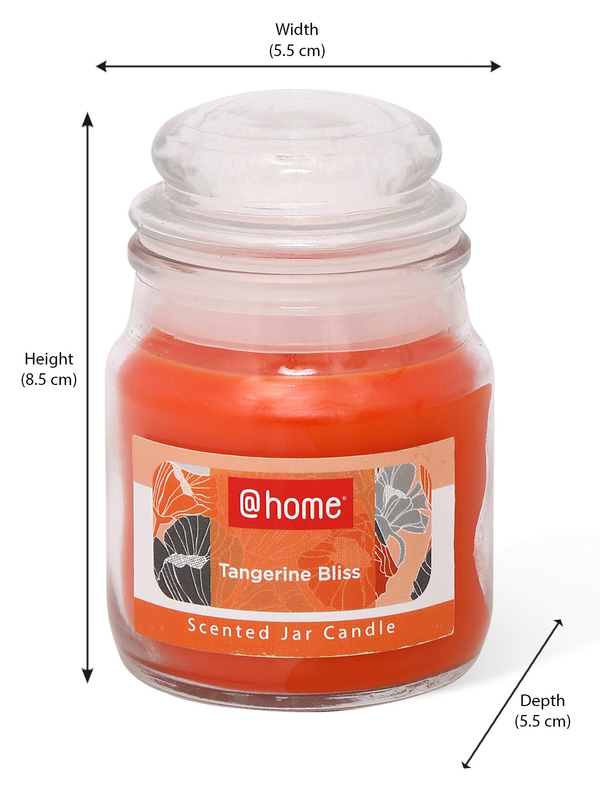 The tangerine bliss jar candle comes with a serene charm and gorgeous appeal. It portrays a smooth, elegant and sophisticated look to the area placed in. It is essential for creating a sense of freshness and calmness in the atmosphere. These richly smelling tangerine bliss orange jar candles are hand-poured exclusively for @Home. The mixture of premium quality of wax and addition of natural cotton wicks make them both long lasting and clean burning. These jar candles have a soothing and sober fragrance thereby covering the area and overpowering one’s mind and soul with its sweet aroma. The candles have the ability to create an aura so pleasing to the heart and mind that it tends to brighten and freshen up gloomiest of the moods of a person. The bright orange colored jar candle blend in wonderfully with all color schemes and every kind of decoration with no or minimum spillage and dripping tendency. A gleam let out of these jar candle spreads fragrance all over the place and embraces its warm smell within every particle which it touches. It is the perfect source of rejuvenating and renewing one’s lost energy and spirit. Our exclusive collection of hand poured, candles brings together unique aroma combination blends to express your rare style and mood. Jar candles are perfect for lighting and decorative arrangements. These are mostly spill-proof and can also be hung using hooks or threads or wires to give a completely different look something which is not monotonous and found easily. Purchase these exclusive and graceful pieces of tangerine bliss jar candles from @Home now.